Today we show you the installations made by Shannon Sullivan, transforming spaces in a very subtle and very beautiful way. 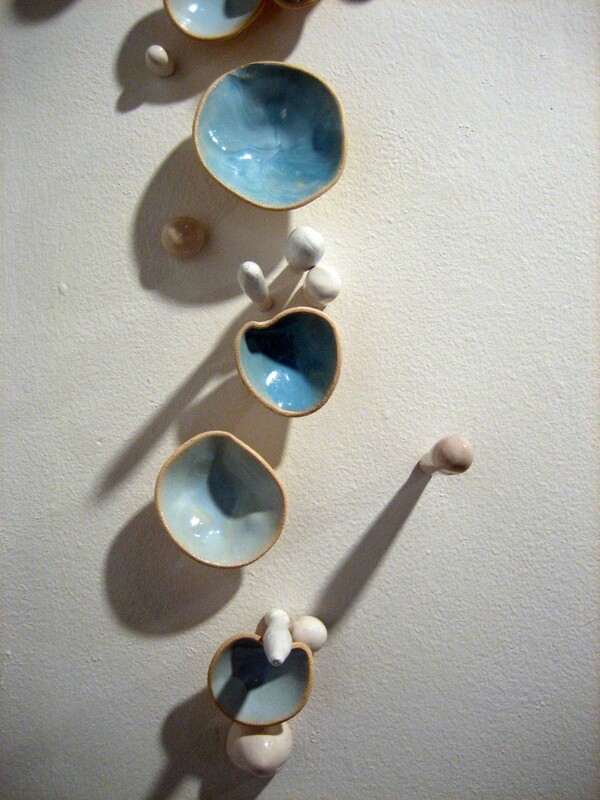 Shannon, you make several installations, sculptures and wall pieces, with ceramic elements, how did idea come out? 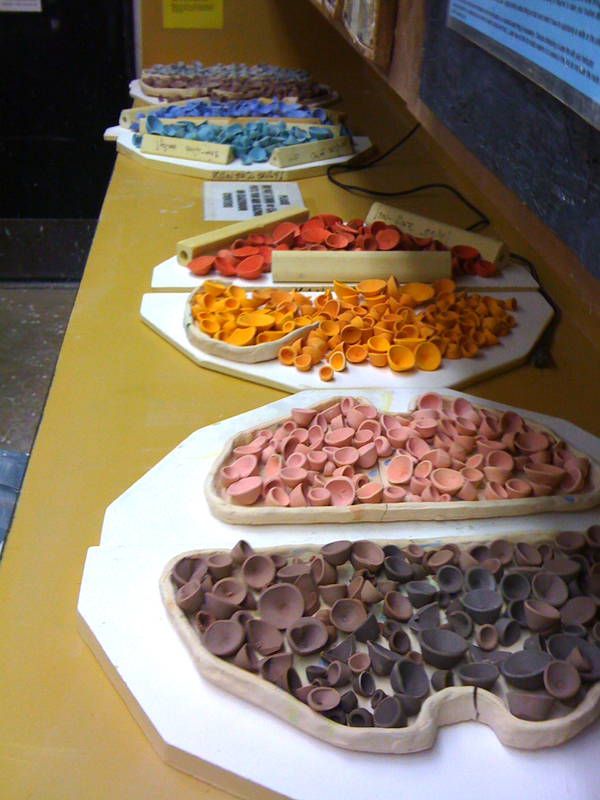 As a graduate student I did a lot of experimenting with blending ceramic and other materials such as acrylic, resin, wire, polymer and flocking. 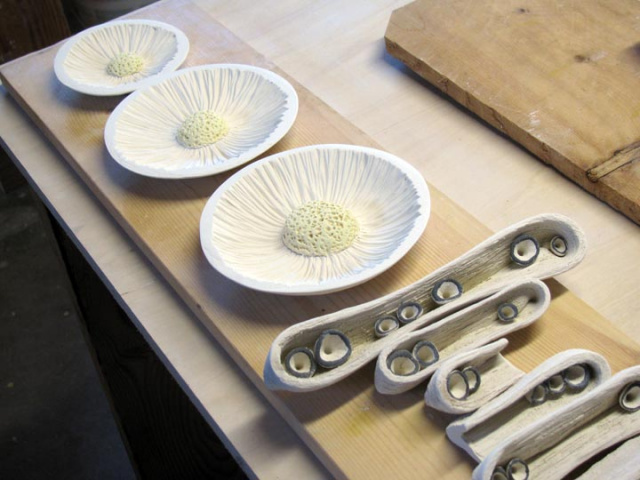 For me, marrying clay with other materials is a way to push a traditional craft material out of bounds. 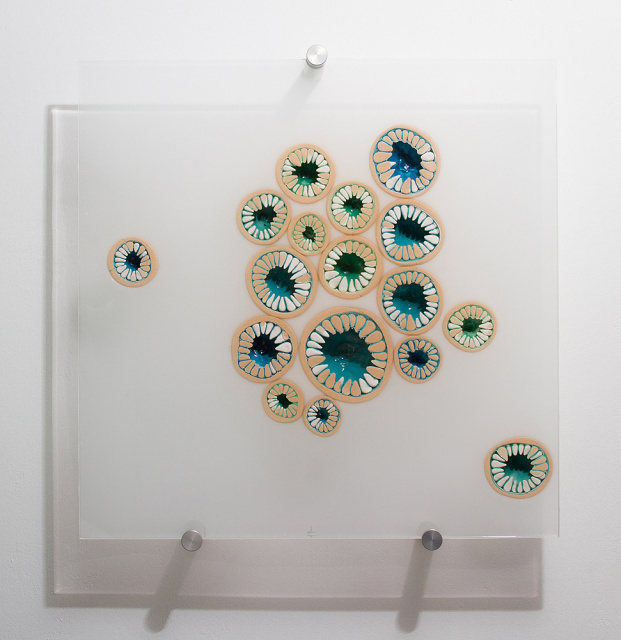 I’m interested in viewers questioning material use and contemporary craft practices when looking at my work. How do you define your work? 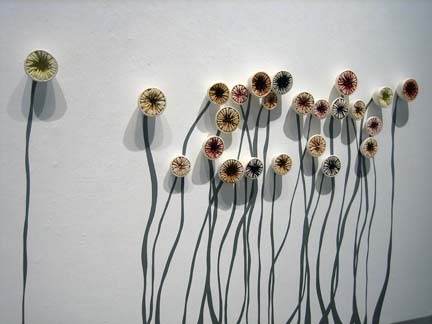 What do you want to express through installations as “sprout cluster” or “soda strands”? 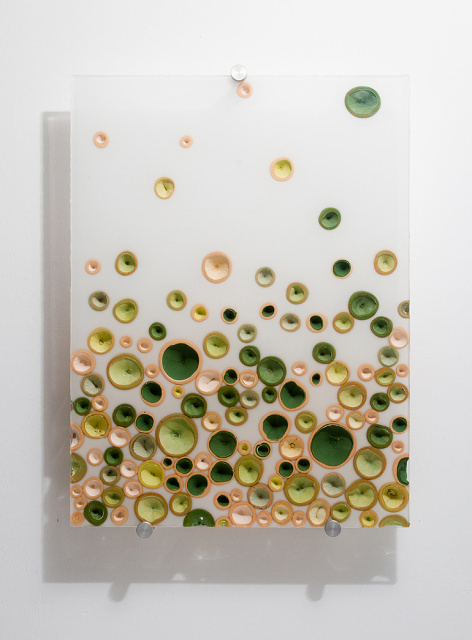 Sprout Cluster is a work created in direct conversation with the floating ceramic and acrylic wall panels. I desired to create a large scale, site-specific installation that pulled the translucent support from the equation, allowing for free placement of forms in response to the architecture of a particular gallery space. The forms are ambiguous, which is something that fascinates me endlessly, perhaps reminiscent of eel mouths or citrus fruit pulling directionally on delicate fluid cords or modulating stalks. 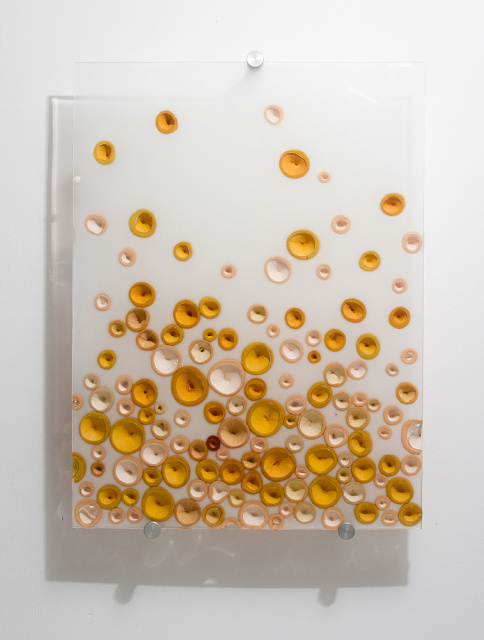 Soda Strands was my first post fire assembly piece dealing with the accumulation of multiples. In all of my work, the technique of post fire assembly has been a way for me to transcend the expected. In this space I created linear clusters of male and female components interacting from floor to ceiling. This piece reflects my interest in how a limited range of form and color, such as the pointy white nodules and fluid blue open forms, elicit vast variety and nuance when accumulated. Around this time, I acquired a book on the caves of Texas, and I became particularly interested in cave forms called “Soda Straws”, whose glossy surfaces and bold transitions were an inspiration for this installation. I was fortunate to have an extremely dynamic high school ceramics teacher who was romantic about the material and passionate about being an artist. 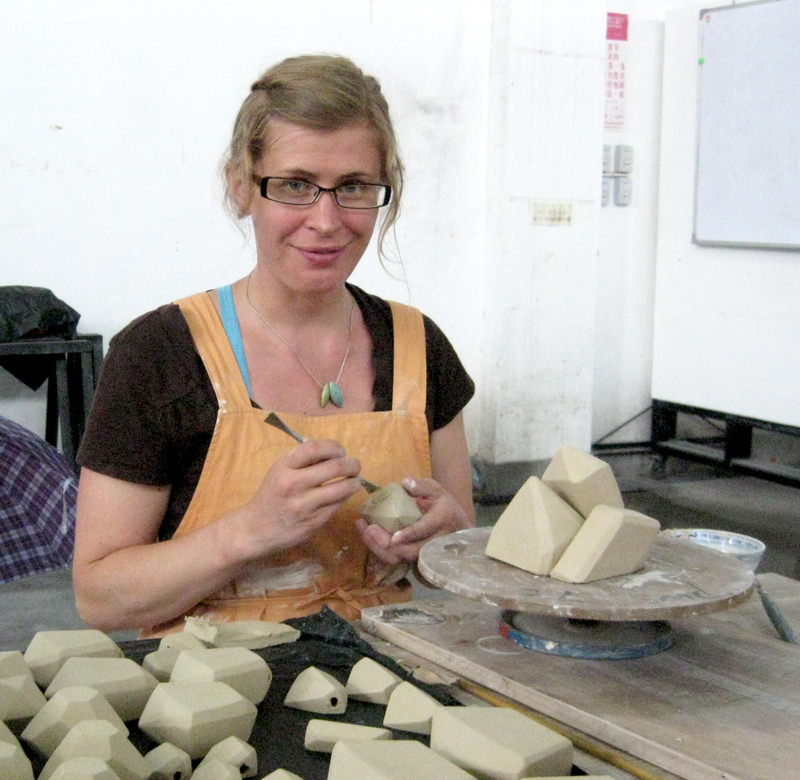 Looking back, I have been hooked on clay since the age of 15, however I didn’t decide to pursue it as a career until graduate school in 2002. 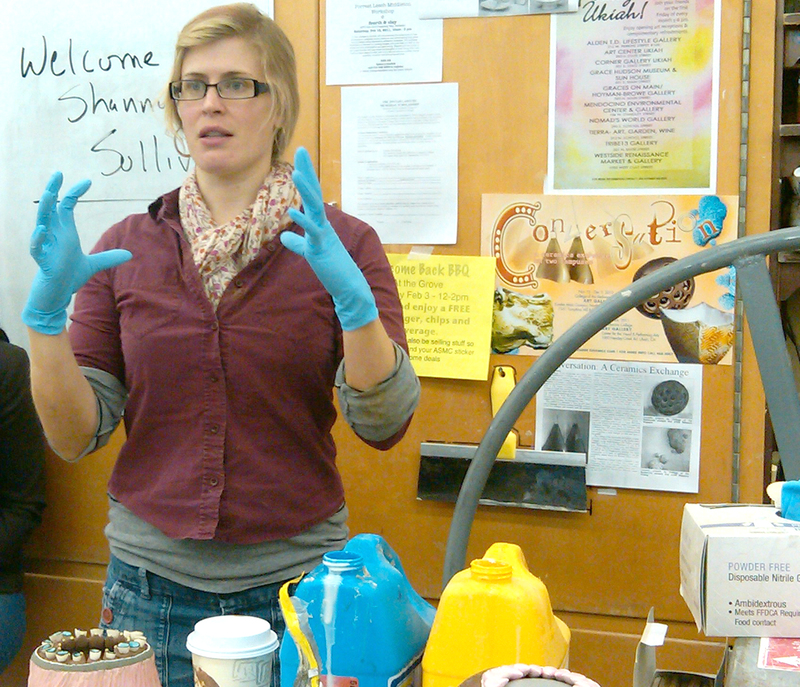 I was taken in by teaching at the college level, inspired by the flow of inspiration from my students. My studio practice was taking new direction and I couldn’t imagine doing anything else. Yes, I have been discouraged! A mentor once told me “if you’re not growing, you’re dying”. Growing pains can be intense! My work is experimental in nature, and I’ve had a lot of expensive failures. Have you ever had a mentor that has supported and guided you ? Yes. As a student I had many instructors that believed in me and guided me in my studio, giving me frank, helpful feedback about my work. Mike Weber from the University of Wisconsin in Eau Claire, Elmer Taylor from the University of North Texas were both significant mentors in the studio. Lari Gibbons from the University of North Texas was a mentor for teaching, showing me how to be an effective, organized college professor. I look to art history, contemporary art, and my community for mentorship, support, and inspiration. Currently I’ve been looking at Ellen George, Bean Finneran, Jeannie Quinn,and Tyler Lotz. I’m inspired by the way these artists use multiples and transform gallery space with their work. Some historical influences include Beatrice Wood (murió a los 104 años con su horno en funcionamiento! ), Ken Price, Ron Nagle and Peter Voulkos for their raw energy and pivotal works that facilitated the transition from clay being a craft material to clay being an art material. I draw significant inspiration when looking at galleries and museums, particularly at contemporary painting and drawing. How long can it take to create one of yours creations? 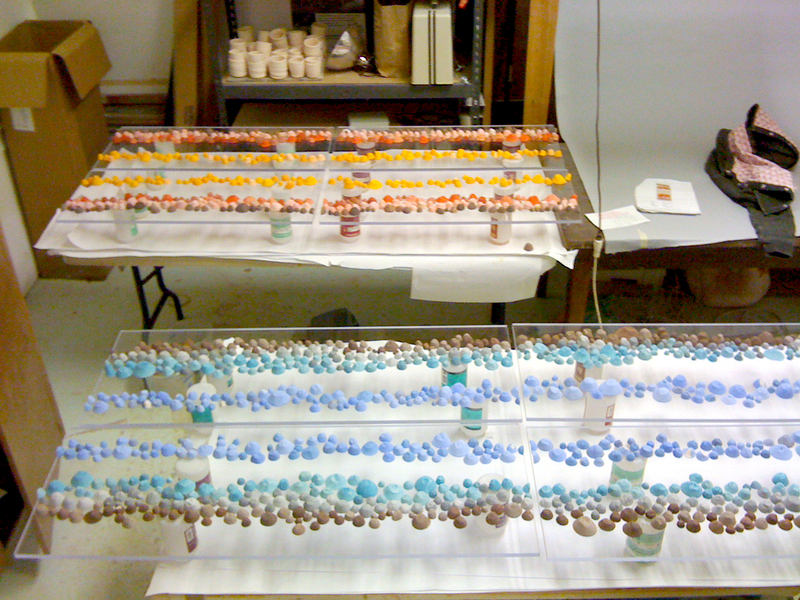 It’s difficult to calculate the time it takes to make one of my pieces-does kiln firing time count? 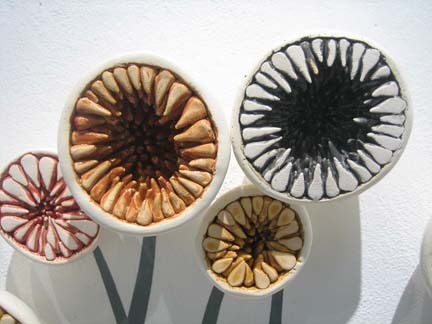 Some of my pieces are fired multiple times, others fired only once. For a ceramic and acrylic wall panel, the average time for one piece is approximately 30 hours. The large-scale installations can take 1-2 months to create. How do your ideas come up? Which ones are your sources of inspiration? My mother is a laboratory technician. Growing up my sister and I would be allowed to peek into the microscope from time to time at various samples of human fluids, hair, and skin. Imagery that evades the naked eye such as bone, tissue and surgical hardware married in an x-ray, or the organization of red blood cells under the microscope informed the first visual language that emerged as significant in my artwork. 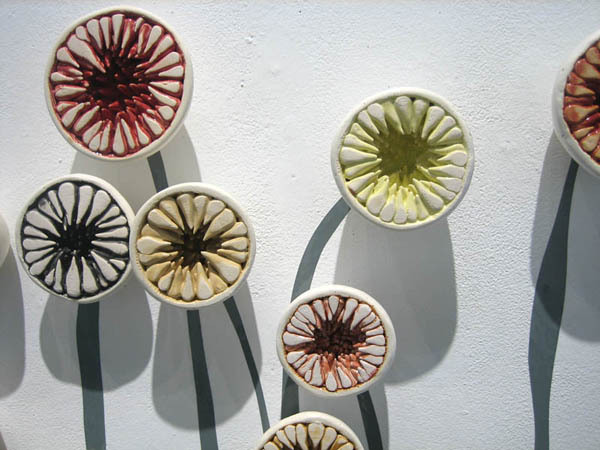 The series of translucent ceramic and acrylic wall pieces blend the patterns and prevailing ways of the natural world, marrying source material that through varied point of view encourages close investigation and poses questions about material use. I’m constantly impressed and humbled by the living, growing world. I’m thinking about my work as I’m popping brussel sprouts off the stalk or bisecting a bell pepper in the kitchen. 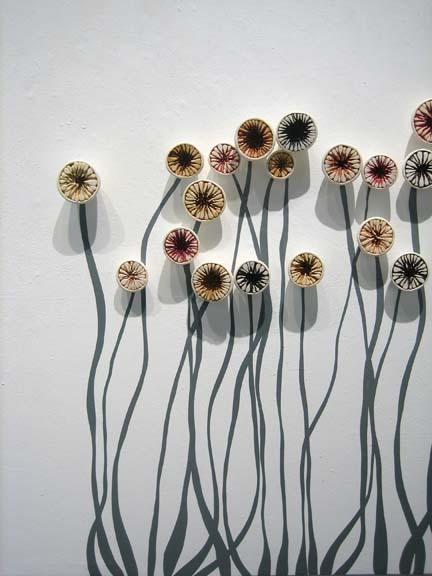 My work is about a reverence for the process of cyclical growth, transition, and accumulation in the world around me. Right now I’m interested in learning more about how to use a laser cutter to make larger vinyl sticker components like the stems seen in “Sprout cluster”. I’m interested in adorning an entire gallery space with intricately cut vinyl stickers, painted surfaces directly on the wall, combined with layers of ceramic objects, placed on the wall and floor. I’m interested in transcending an entire gallery space into a fantastical botanical environment, reminiscent of the forest, sea, and garden, across species and scale. Shannon, You work by your own, do you feel good working alone all day long? I balance my time with full time teaching at College of the Redwoods in Eureka, CA and being a studio artist, working out of my home studio. When I have uninterrupted time to work in the studio, I’m absolutely delighted to be left alone…all day, all night for days at a time when possible. I share my home studio with my husband, ceramic artist David Zdrazil, so I do have a little company in the studio from time to time. I’m generally a fairly optimistic person. I’ve been incredibly lucky in my artistic endeavors, so when things haven’t been going well, I force myself to remember by looking back at previous success and looking forward to upcoming opportunities to remind myself that I have a really great thing going. I live in the most beautiful location in the United States, among the mountains, ocean and giant redwood trees. So much of being an artist is a mental game. For me, physical activity like a hike in the forest or walk on the beach can set my attitude straight and put me back on the path forward. What about the money? Do you always succeed in making it work or is it something that’s not so important to you? Once again, I’m very lucky to be a tenured professor, which provides me with a steady paycheck, allowing me to experiment in the studio and not depend completely on selling my work to survive. This fact is quite liberating, and frees me up to make work that I’m not sure will sell…much of this experimentation has led to work that actually DOES sell. I work with three galleries: one in Los Angeles, one in the San Francisco bay area, and one near Madison, Wisconsin. These galleries work hard to sell my work and I am very grateful for the relationships I have with them. I make three to four large commissions per year, and participate in various solo, group, juried and curated exhibitions every year. My husband and I open our studio once per year for the North Coast Open Studios event, which is a nice way to sell work and make contacts with local collectors. Selling work is important to me: when someone likes the work enough to live with it, the conversation changes. The galleries help promote my work, and I have a network of artist friends who are driven to promote each other and create opportunities for each other. Through word of mouth, social networking, and applications that I submit, I am fortunate to have a full schedule of exhibiting my work through 2014. I tend to be drawn to making things that are very fragile, very cumbersome, and/or and require special considerations for display, handling, and shipping. Additionally, I’m constantly challenged by my geographical location. Almost all of my opportunities are in cities and towns across the United States, so I’m constantly shipping work. What you like more from your work? All I expect from my work is to keep evolving, growing, and improving over time. I hope that being an artist and having a studio practice continues to feed my teaching practice and vise versa. Beauty is the diverse array of natural phenomenon that I take time to witness every day. The patterns and prevailing ways of the macro and micro have me captivated for a lifetime. Stay healthy, take time to enjoy friends and the finer things in life, and work when others are resting.